For lots of people, the idea of an adventure cruise means some far off, distant land, icebergs and glaciers. But some dinkum Aussie operators provide world-class products right here from our favourite cities. Of those operators sailing Australian-flagged vessels with all-Australian crew, North Star Cruises in Broome, Coral Princess Cruises in Cairns and Captain Cook Cruises in Sydney come quickly to mind with itineraries covering the entire coastline of Australia, including the Murray River. Iconic destinations such as the Kimberley and Great Barrier Reef are well covered, but dig deeper and you’ll find semi-secret locations such as the Rowley Shoals in WA and Cape York and Arnhem Land across our Top End. North Star Cruises continue their Southern Safari out of Adelaide that covers Kangaroo Island and Eyre Peninsula with the exciting “Jaws” shark cage dive as highlight. Coral Princess Cruises, one of the premium operators in the Kimberley, are even offering a free Great Barrier Reef Cruise for every new booking in the Kimberley this year. (this offer was supposed to expire end August, but tell them CW said it was extended by 7 days for subscribers only!) Otherwise a 15% earlybird applies for 2010 dates. It’s a bit harder to keep track of some of the smaller operators offering niche products, but Pearl Seas Cruises, Cannon Charters, Great Escape (pic r), Matrix, K2O and One Tide all offer intimate vessels of around a dozen passengers and can be booked through the one-stop Kimberley Cruise Centre or direct. These little ships are great for divers, fishers and small corporate or family groups. The multi-award-winning Orion Expedition Cruises are an Australian Private Company operating the 106-passenger Bahaman-flagged Orion. 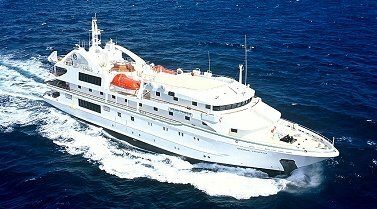 The “grand dame” of our adventure fleet, Orion offers the nearest thing to a big ship experience, yet still keeps that adventurous touch. Their just-announced 2010 brochure includes a wealth of local cruising options including our east coast, Queensland, Tasmania, Victoria and South Australia – many of which are firsts for Orion. The loyal following will have plenty of reasons for repeat cruises next year and new cruisers may want to try them too. So if you’re hankering for an adventure cruise and don’t want the jetlag, there are stacks of great opportunities in brilliant vessels right on our doorstep. Print this page now, race into your favourite travel agent and get aboard!